A new year, a new start, a new word for the year. But before that a little bit more reflection on what living lighter actually meant for me last year. It meant that I stripped back both the girls and my schedule, and we had times of relaxation and rest. It meant that there were times people called and we were available. It meant that I had to deal with some of the emotional baggage I had been carrying around and hiding with my constant activity. It meant that I intentionally put myself in a place of silence and rest. It meant on a practical level that there is a little less mess and a little more organisation in my house and my routines. I haven’t done this living lighter thing perfectly. My gratitude jar for example was haphazard for a good part of the year and then totally abandoned by the end of the year. I still need to learn to think before saying “yes” and be more willing to say “no” sometimes. I need to actively remember to be in the moment instead of worrying about the ‘what if’s’. And yet I feel that this year my load has actually been lighter. I feel like I have (with God’s help) dealt with some stuff that has been weighing me down, emotionally, physically, spiritually and mentally. I feel like life has been less cluttered, and has more boundaries and margin. And the by-product of this, that I had not been expecting is joy. Joy in the moment; joy with my girls and Mr; joy in the little things; joy in my home and garden; joy with my friends and family … I actually could go on forever! I hesitate in writing this because I am half-worried that I have turned into a person who does not live in the real world and sees the golden lining in everything, but I have even found moments of joy in the hard times! 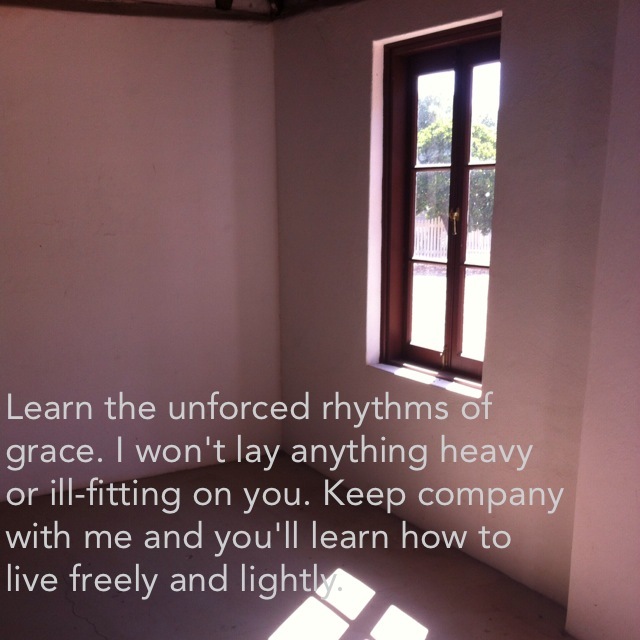 And while all of this is still not natural to me, maybe, just maybe, this year I have grasped something of what the “unforced rhythms of grace” look like?